Find all the PILOT STUDIOS comic books in one place at Indyplanet.com right HERE! NEW! Pilot Studios STICKERS! Just send $1 for each sticker you want yo buy, as well as a self addressed stamped envelope to Ben Ferrari @ 1826 Silverwood Dr, Concord, Ca. 94519! Just like the image below, but a little smaller. 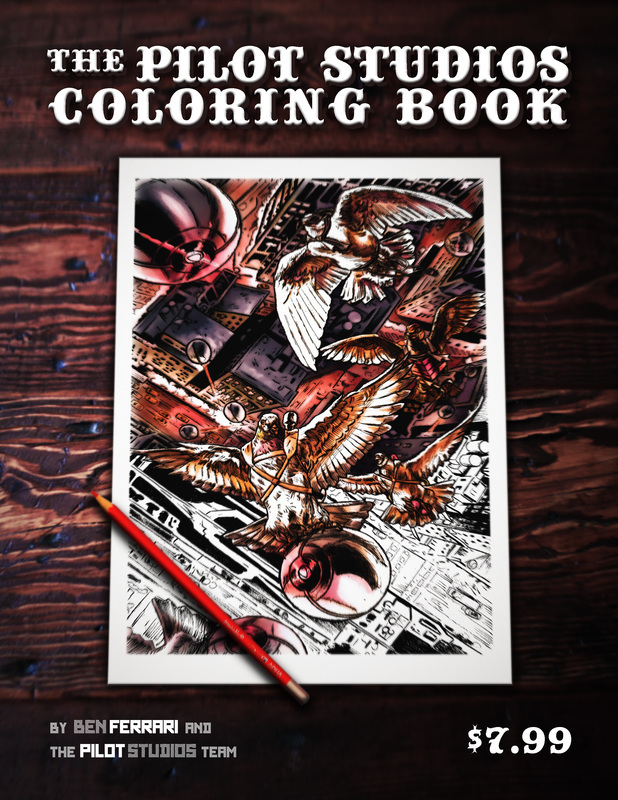 Pilot Studios has a COLORING BOOK available on Amazon! Click here to buy the darn thing! A stand alone story featuring The Carriers versus Grayfeather and the Pirate Seagulls! Who is working for whom?! And to what end?? Buy it here at Indyplanet.com! CARRIERS: WAR CORRESPONDENCE #1 is a huge PIN-UP BOOK available now at Indyplanet.com! Cover by Shelby Robertson with tons of work from today's rising stars like Jim O'Riley, Ki Kim, Kurt Belcher, Vic Moya and so many more! A stand alone story featuring Fable! A flashback to his WW1 days and his friend the world-famous (based on a true story and actual carrier pigeon!) Cher Ami! Buy it here from Indyplanet.com! She's an American soldier stationed in The Green Zone in Iraq! She heads out into the population as a vigilante to help the Iraqi people, because let's face it, they're screwed! A collected edition, created and art by Ben Ferrari, stories by Ben and Mike Luoma. All stories originally from Lady Fight #1-4. Cover by Seth Frail and Chuck Michael Obach! Buy the issue at Indyplanet.com! Issue #1 of a two-Issue mini-series, written by Buck Weiss. Art by Kurt Belcher, colors by Ken Lateer. Co-created by Weiss and Ferrari. The son of Hitler, out to REDEEM the Hitler name! Tall order! He's a good guy, taking out people like his father! Controversial! Like The Punisher, but with a MUCH better backstory! Cover by Martin Montiel, Juan Castro and Chuck Michael Obach! Issue #1 available at Indyplanet.com! We learn the horrible origins behind The Three, just as The Stars return to the spotlight as the world’s most famous super-team. As the reunified team premieres in front of a collection of politicians, celebrities, and paparazzi aboard the heroes’ space station, the Constellation, The Three launch their attack. While the recent actions of The Three are investigated and their enemies press forward with their plan, The Stars learn that they may have a traitor in their midst. The Stars made their name battling superhuman weapons of mass destruction until a mission gone wrong put them on hiatus. Now reassembled by their super-celebrity leader, John Century, the group is being subtly manipulated as they try to replace lost members. Buy issue #2 at Indyplanet.com! Before The Stars can get back to business as usual, they have to defend themselves against an attack. Secret Russian superhumans are executing a hostile takeover of the planet… and the only thing in their way is The Stars! The Stars made their name battling superhuman weapons of mass destruction until a mission gone wrong put them on hiatus. Now reassembled by their super-celebrity leader, John Century, the group is being subtly manipulated as they try to replace lost members. Kurt Belcher and Pilot Studios present 3 stories planted firmly in the Horror and Sci-Fi genres! Say hello to this anthology from one of the most prolific and imaginative minds in indy comics, Kurt Belcher! Kurt writes all these tales, and has enlisted a few of the best artists to bring his to life! And they succeed! 1st issue available at Indyplanet.com! A story about the bad guys, the villains. They think they are doing the right thing, their methods are justified. A story that asks real questions and that makes the answers even more difficult. Story by Ethan Slayton, art by Ben Ferrari. Black and White. Cover by Angel Rams and Chuck Michael Obach. The first books we published, check out this compilation of the anthology series featuring all-female action stars! Art and stories by Matt Grant, Ben Ferrari, Mike Luoma, Sebastian Piccione, Mike Dreher and more! Cover by Luis Rivera and Fabian Cobos! Before we were Pilot Studios we made comics as Earthbound Comics! This one shot was the ultimate book we did, collecting character pinups and bios for almost every single comic book and character we published. It was brutal. But it makes for a stunning achievement, we think you'll agree. For sale at Indyplanet.com! drivethrucomics.com. The Longhunters is a frontier epic revolving around a group of mountain men wandering the untamed North American landscape of the early 1800's! Their stories are tales of America and our writers and artists work hard to mix authentic history with fictional adventure; presenting a violent and dramatic world of Native Americans, rogue military officers and invasive settlers. The Longhunters sets itself apart from the normal Superhero, Western and Sci-Fi genres, and makes its mark as one of the few Frontier books on the stands and easily one of the best. This trade paperback features a wrap-around cover by Fubar, Winter War, and The Stars artist Kurt Belcher, along with inker Victor Moya and colors by Chuck Michael Obach. Compiles Longhunters #1-4, art by Ben Ferrari, with Ruth Garcia Martin and Jeff Graham. Stories by Ben Ferrari, Buck Weiss and George Myers. Cover by Kurt Belcher, Vic Moya and Chuck Obach! Pick it up at Indyplanet.com! Pilot Comics, Taking Comics to the Sky!